It's been a minute since Rihanna bestowed to us her Shoe of the Year 2016, sell-out Fenty creepers. Okay, it's been three and a half months — but who's counting? The performer-turned-PUMA-designer hasn't left us totally hanging, of course: She's had a runway show and a restock for PUMA in the time since her last sneaker introduction. Now, Rihanna isn't letting us start the New Year without some fresh FENTY kicks. Splashed with some extravagant velvet. The sneakers come with tonal soles, waxed laces and metallic gold branding, and have been handcrafted in Italy for some suitably luxurious credentials — this is Rihanna after all. There’s three colourways, and they all come with a matching velvet dust bag. 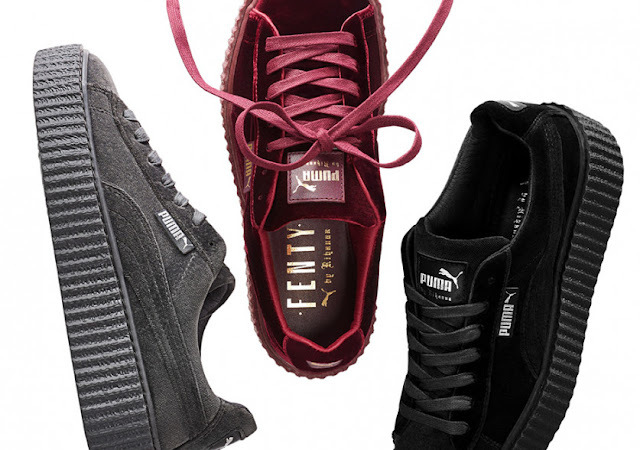 The FENTY x PUMA Velvet Creeper will drop on Wednesday, 25 January 2017, in three colourways (black, burgundy, and a grey hue dubbed cement) for R3499 at PUMA SELECT Bree Street, Cape Town and Braamfontein, Johannesburg.